The Florida State University Board of Trustees has selected state Sen. John E. Thrasher, an FSU alumnus, to serve as the university’s 15th president. Thrasher, 70, succeeds Eric J. Barron, who became president in 2010. Provost Garnett S. Stokes has served as interim president since Barron left in April to assume the presidency of Penn State University. The appointment is subject to approval by the Florida Board of Governors. Thrasher was one of four finalists forwarded to the trustees from the 27-member Presidential Search Advisory Committee. The committee interviewed 11 candidates out of 39 applicants before inviting four finalists back to campus for open forums with students, faculty, staff and community members. “John’s legislative background coupled with his strong administrative and fundraising skills are an excellent fit for Florida State University, and the Board of Trustees is looking forward to working closely with him to advance the university to even greater national prominence,” said Allan Bense, chair of the Board of Trustees. Thrasher earned a bachelor’s degree in business from FSU in 1965. After leaving Florida State, Thrasher joined the U.S. Army where he received the Army Commendation Medal in Germany and was awarded two Bronze stars for his service in Vietnam. He was honorably discharged as a captain in 1970. Thrasher then returned to his alma mater to earn a law degree with honors in 1972. In his political career, Thrasher has served on a school board, in the Florida House of Representatives and in the Florida Senate. His success as a leader, businessman and lobbyist has helped him to develop strong ties within the community. After working in private law practice in Daytona Beach and Tallahassee for several years, Thrasher returned to Jacksonville to serve as general counsel of the Florida Medical Association, a position he held for 20 years. He also served as “of counsel” to the Jacksonville law firm of Smith, Husley & Busey from 1996-2008. Thrasher was a partner of Southern Strategy Group, a Tallahassee-based governmental relations firm, from 2001 to 2009. Thrasher’s political career began in 1986 when he was elected to the Clay County School Board where he served as vice chairman, then chairman. From there he would become a state representative in 1992, and he was re-elected without opposition in 1994, 1996 and 1998. Thrasher was unanimously elected as the Speaker of the Florida House of Representatives in 1998, where he supported legislation such as the “A+ Education Plan” and the largest tax cut in Florida history. In 2009, Thrasher was elected to the Florida Senate and was subsequently re-elected. He served as chairman for the Republican Party of Florida in 2010. As senator, Thrasher served as the chair of the Rules Committee and was involved in the Appropriations, Community Affairs, Ethics and Elections, Gaming, Judiciary, Regulated Industries and Joint Legislative Budget Commission committees. He also served on the Appropriations Subcommittees on Education as well as Health and Human Services. 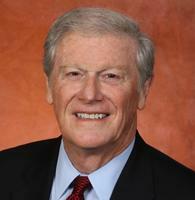 From 2001 to 2005, Thrasher was the first chair of Florida State University’s Board of Trustees. In 2002, Thrasher was a key supporter of legislation that brought funding to the development of FSU’s College of Medicine, and a building there is named in his honor. Born in Columbia, S.C., Thrasher grew up in Jacksonville after moving to Florida in 1949. He and his wife, Jean, have three children and eight grandchildren.